May 10, 2011 · Australia's Got Talent 2011 Audition show 3 Thomas Crane, Freddy Mercury impersonator sings The Great Pretender from Queen. 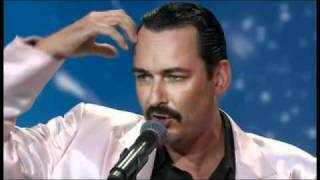 Jun 14, 2011 · Australia's Got Talent 2011 Semi FInal 3 Freddie Mercury Impersonator Thomas Crane performs Radio Ga Ga by Queen. Aug 25, 2012 · Crazy!!! Incredible!! He sing like Freddy Mercury !! Thank you very much..
Freddie Mercury best voice, FREDDIE MERCURY the best voice, The Greatest and Most Powerful Singer Ever - Freddie Mercury (singing "How can I go on?" May 14, 2011 · The beautiful, the amazing, the talented, the amusing, the absurd. Due to my lack of talent for hardwork, I never mastered any musical instruments. Sep 04, 2014 · Watch the video «Australia's Got Talent 2011 - Freddy Mercury» uploaded by vega54 on Dailymotion.